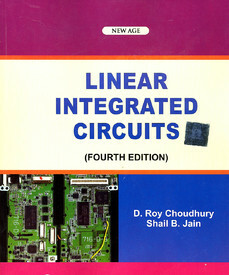 Linear Integrated Circuits is a comprehensive reference book for students of various engineering courses. It focuses on operational amplifiers and linear integrated circuits, covering concepts like fabrication of integrated circuits, the 555 Timer, differential amplifiers, switched capacitor filters, and current mirrors. The concepts are explained at length and in a manner that assists self-study. In the current edition, many of the topics have been thoroughly revised to account for the advancements in the pertinent fields. Several practice exercises and solved examples have been included to strengthen the students’ understanding of the subject. This particular edition of the book was published in 2010 by New Age International. Its sales are limited to a few select countries like India, Sri Lanka, Maldives, and Bhutan. D. Roy Choudhury is an Indian professor who teaches undergraduate and postgraduate courses in computers, control systems, and linear integrated circuits. He has a master’s degree and a PhD in Radiophysics and Electronics from the Institute of Radiophysics and Electronics, Calcutta. He is currently the Head of the Electronics and Computer Engineering department at the Delhi College of Engineering, Delhi. Networks and Systems is his other book. Shail B. Jain is an Indian professor, and currently the Head of the Electronics and Computer Engineering department at the Indira Gandhi Institute of Technology, Delhi. His interests lie in the areas of neural networks and digital signal processing. Electronic Devices and Circuits is his other book. Please upload the complete book. some pages of it are not available. I need the book very badly.